The lovely Nine Glens bite deeply into the basalts of the Antrim plateau and into the hard overlays of modern history. Cut off, until a century ago, by land barriers, these green pockets of Gaelic life have kept their own distinct tradition and character. Their outlook was always towards Scotland, whose white-washed houses may be seen on clear days across the Stream of the Moyle; and their turbulent lords, the MacDonnells, were also Lords of the Isles. Since the opening of the fine coast road, designed by Lanyon in 1834, the little harbours at the mouths of the glens have grown to seaside resorts, and Carnlough, at the foot of Glencloy, has its ribbon-development and its straggle of caravans today. George Shiels, the Ulster playwright, lived here, and Sir Winston Churchill owned house property which, between the wars, he gave to the occupiers. To the North of the bay is Garron Point, near to which is the rock of Dunmaul, anciently fortified. Tradition says that in olden times all the rents of Ireland were paid at the place, and from it the last Danish invaders embarked. A number of small mountain lakes behind Carnlough offer good trout fishing. 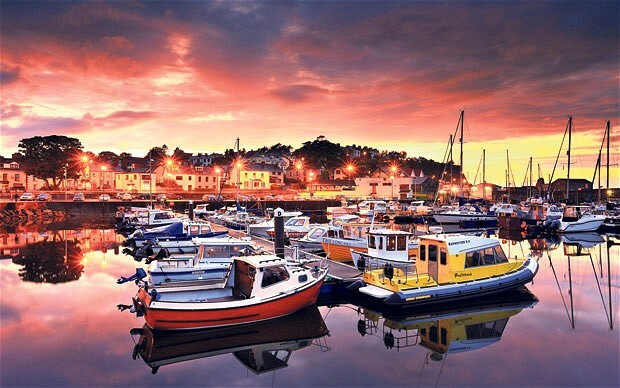 Carnlough is a real hidden gem that is worth a visit on your tours of Ireland.